A Rock The Bike exclusive! Our DC mod eliminates the need for AC power for your loudspeakers, making Pedal Powered Stages up to 44% more efficient. Above: Modified PRX 612 wedge monitors in use as the band ZH performs. 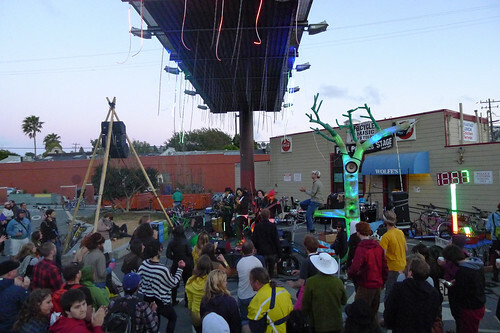 Also shown in aerial configuration in Rock The Bike’s Pedal Powered Line Array (suspended from Bamboo Tripod). An awesome combination of light weight, efficiency, and Pro Audio clarity. 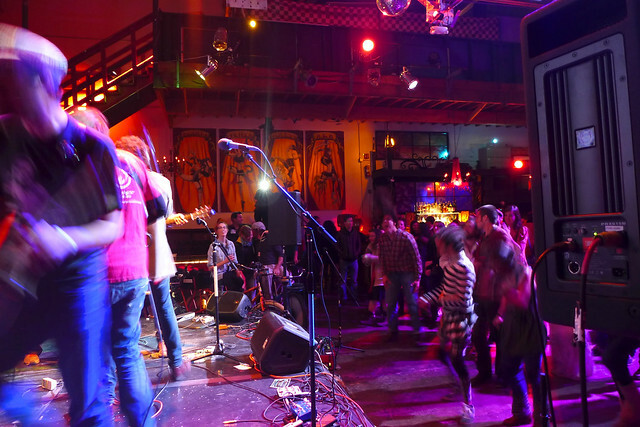 The Modified JBL PRX loudspeaker has been an essential building block of our Pedal Powered Stage, and is in use by the Pleasant Revolution, SHAKE YOUR PEACE!, University of Oregon, UC Santa Cruz, Cello Joe, and the Mobile Music Project. Not limited to Pedal Power use, the Modified JBL PRX line is an amazing Mobile Sound speaker as well. 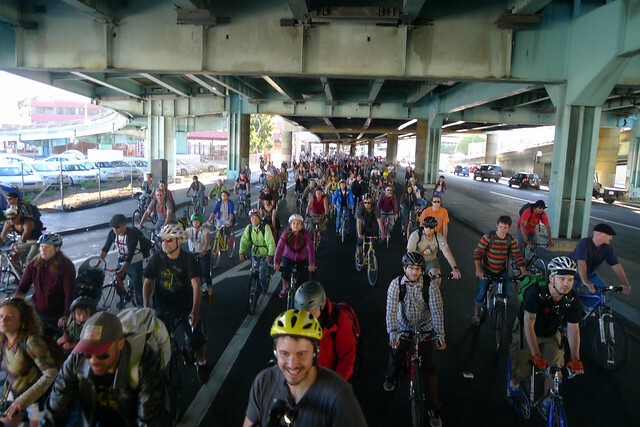 The applications are as broad as your needs: bike parties, press conferences, or full-on concerts. We can help you craft a selection that will handle crowd sizes from 50 to over 1000 people. Normally, Pro Audio equipment runs on AC power, which in outdoor use must come from an extension cord from a nearby building, a gas generator, or an AC-DC inverter. If you’re starting your Pedal Powered Stage from scratch or are ready to upgrade your loudspeakers, go with Rock The Bike’s Modified JBL PRX. They deliver great sound with no AC power and save you up to 44% in power usage. 44% power savings– how’s that possible? It’s true! We scientifically measured the power consumption of these loudspeakers in AC mode and Modified DC mode, by running a bass-heavy tone into the speaker and confirming that the audio output level was equal. The speakers used 35% less power in DC mode, for the same audio output! Add to that that the 9-10% efficiency penalty that most AC-DC inverters take, and you get a 44% power savings by using them in DC mode. In practical event use, this means you get the same amount of clean, clear, danceable music, but with 40% fewer pedalers. 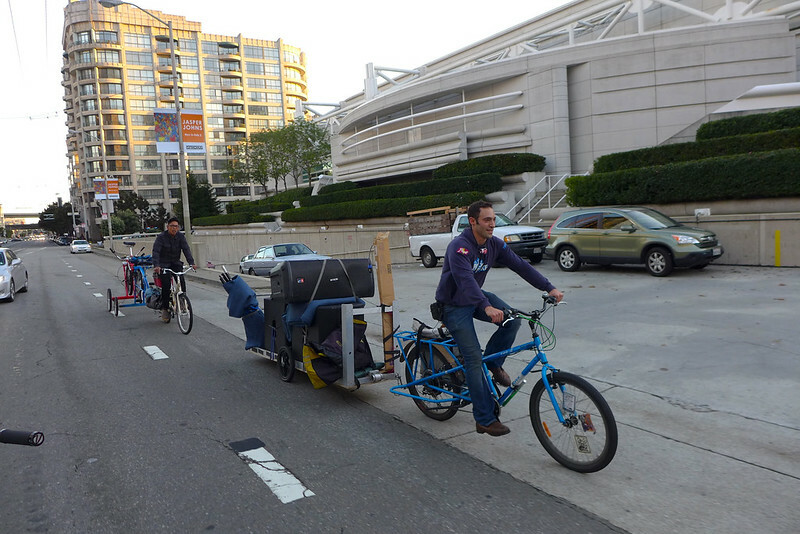 You can do amazing things with even one pedaler. In the world of Pro Audio, 44% is an unheard of efficiency gain, and the PRX line, with its digital Crown amplifiers, was already known for being an efficient loudspeaker. JBL did the hard work of creating a full line of great-sounding loudspeakers. We cracked the code of getting them to run on good clean Pedal Power. You can combine these loudspeakers in a number of ways to create a small or medium-sized festival stage, or mobile sound system. We modify the speaker, adding a power jack that accepts a DC Split-Rail Power from our Split-Rail Pedal Power Utility Box. Normally pro-audio gear is well beyond the abilities of the average person, in terms of ease of setup and use. But because these are powered speakers, it’s fairly straightforward. A ‘powered’ speaker means that the amplifier is in the speaker. You simply connect the power cable and the audio signal, and turn the volume knob to the desired setting. The speaker does the rest. For a press conference, you can run a microphone right into the speaker — you don’t even have to own a mixer. Similarly for mobile sound, you can run an MP3 player right into the speaker. Above: A Modified PRX 612 in use for a LiveOnBike performance by the Shook Twins. We sell the full line of JBL PRX Loudspeakers, however due to space considerations we keep a very low inventory of this item. Please get your project started early with us in order to hit your key event deadline. Here’s the rundown of the speakers in the PRX Line. 615 — similar but with its 15″ woofer, it can be used as a respectable main speaker as well. 635 — a dedicated 5″ midrange woofer in this speaker renders vocals and instruments with great clarity. 15″ woofer delivers plenty of bass. Above: The Modified JBL PRX 615 is a solid main. Most bike music projects use car audio componentry, because it is cheap, widely available, and will work on 12 volt DC power such as a motorcycle battery. However, car audio equipment cannot amplify musicians at a concert, because it does not have the efficiency, overall listening levels, and clarity required. It was designed for small enclosed spaces, not large open spaces. That’s why you need Pro Audio equipment. Our modified JBL PRX loudspeakers are the best of both worlds. They provide concert quality sound and are ready for DC power, i.e. Pedal Power! 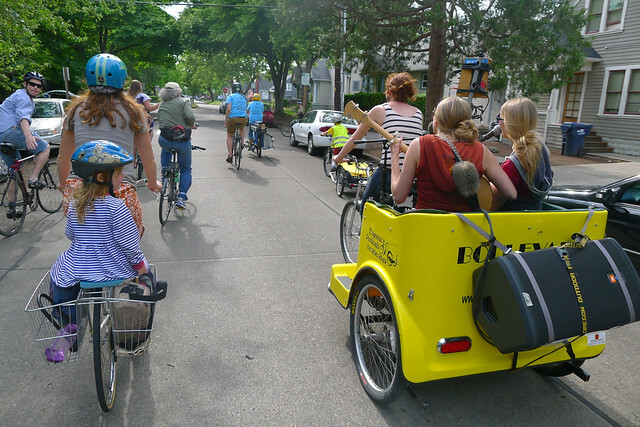 Above: The Modified PRX’s are fairly lightweight and can be towed by trailer or hauled on cargo bikes. The package: lightweight but great sounding. All modified JBLs are made out of quality plywood — not plastic — and have a durable coating for dings and drops. They can all be carried by bike, and with the exception of the 618 subwoofer and the 625, they can all be lifted by one person. 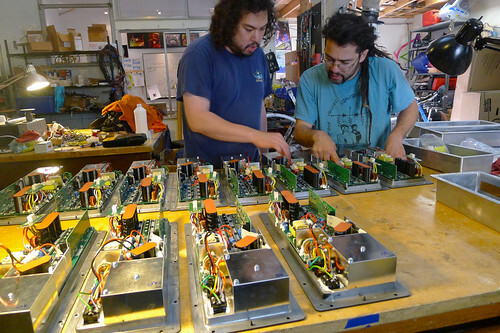 Above: Engineer Jake reviews the modifications of our JBL PRX amplifiers. Above: Locura’s bassist Izzy Wise digs the punch of the Modified JBL PRX 618 XLF Subwoofer. Our latest generation of Pedal Power Utility Box has ‘Split Rail’ outputs that connect directly to these speakers. You can ignore the AC power sockets. Elevating the speaker on a stand (or by using our custom Line Array) puts them above ear level, which dramatically improves the clarity of the music when there are multiple rings or rows of people listening. 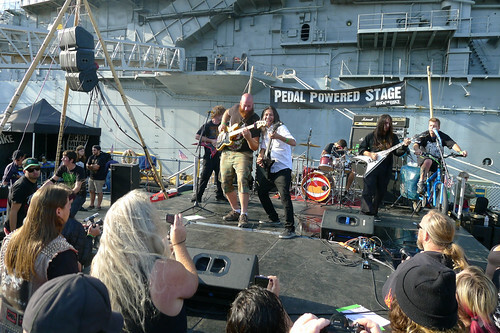 Above, left: 3 modified JBL PRX 612 loudspeakers suspended in a Line Array configuration at Bicycle Music Festival. We maintain a relationship with JBL’s official Bay Area service point, JK Sound, and can take care of any issues that come up. JK Sound has successfully repaired amplifiers and replaced drivers for speakers post-mod. After our initial R&D phase in 2009-10, we have had very few problems with this line of speakers. We have confidence in these loudspeakers and stand behind the DC mod. We have been selling these to sponsored musicians in the Bay Area with great results, and without any warranty problems. 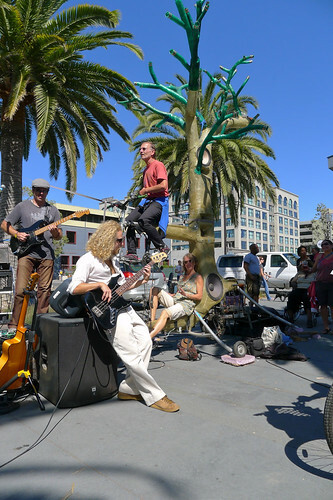 The modified JBL PRX loudspeakers are also the secret behind Rock the Bike’s most famous art bikes, including the Blue Whale and El Arbol below. 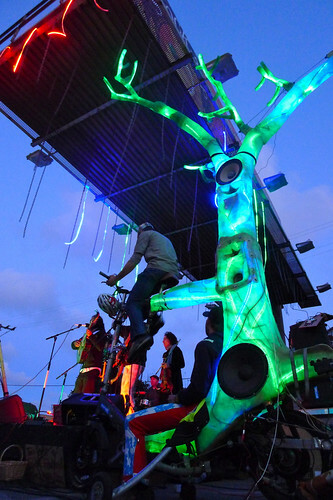 Above: El Arbol, the Bike Tree, uses the active components from the PRX 635 and 612. Can I use my own speakers / mixer and still benefit from your Pedal Power system? Activist rapper Boots Riley's spoken word at the People’s Climate Rally Oakland, Rock The Bike's biggest event ever. Thanks to the 350.org Bay Area and System Change Not Climate Change organizers, volunteers, and attendeeds, and Rock The Bike crewmembers who came together for the People’s Climate Rally this past September 21 on the shores of Lake Merritt in Oakland. A major highlight of the event was Boots Riley’s spoken word and song during the peak of the event when at least 2500 people were in attendance. Skip ahead to 5:15 to hear the poem (warning, language!) Check out the awesome dance moves of the pedaler on the Tree during the song Ghetto Blaster (at 3:12). It’s inspiring to hear an activist talk about people power while using a people-powered PA system. 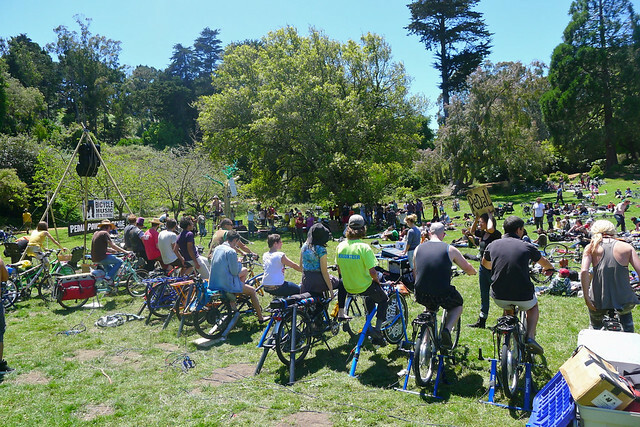 It was our largest audience size to date by more than double, the previous being the 2013 San Francisco Bicycle Music Festival in Golden Gate Park at about 1000. 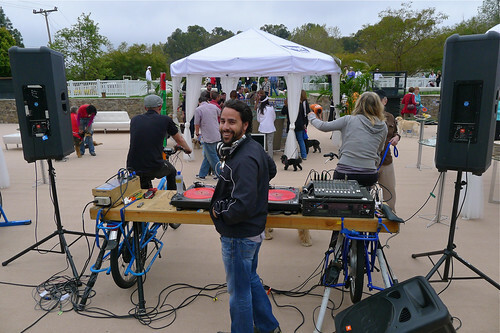 This article features our 2 Modified JBL PRX speakers, 3 Mundo 500‘s, a pedal power Utility Box and the Biker Bar. Shaun O’Dell published this article in the Register-Guard on May 6, 2010. Look for a bunch of music lovers on Saturday who plan to pedal — not peddle — on behalf of live musical acts. Thanks to $10,000 in tourism grants, the University of Oregon Bike Program has been able to purchase equipment for this year’s Bike Music Fest that will help support live music acts by pedal power. The Bike Music Fest, which is incorporated into the Willamette Valley Music Fest, happens Saturday from 10 a.m. to 4 p.m. The larger music festival will continue until midnight.